Christmas carries with it a lot of expectations. It's a time of year when the pressure to have the perfect holiday with family or friends can take its toll. Perhaps you are overloaded with tasks, or perhaps, for you, it's the opposite, you feel alone and as if everyone else is having the time of their lives. Wherever you are in the run-up to the big day, it's probably a good enough guess to say that it's not always the most relaxing time of year. Fortunately we can unwrap a few CBT and mindfulness cues to help us stay calm and prevent us from going off like a Christmas cracker! It's everywhere. Love it or loathe it, if you leave your home, you will hear it. You can use festive music as a reminder to check in with your thoughts, noticing what's going through your mind, noticing how you feel (your emotions and your body), before shifting your focus for a few minutes to focusing on your breathing, just noticing your breath going in and out. It's like a mini-timeout and can help to soothe stress, giving you a little space before choosing to move on to something new or continue what you are doing with fresh eyes. 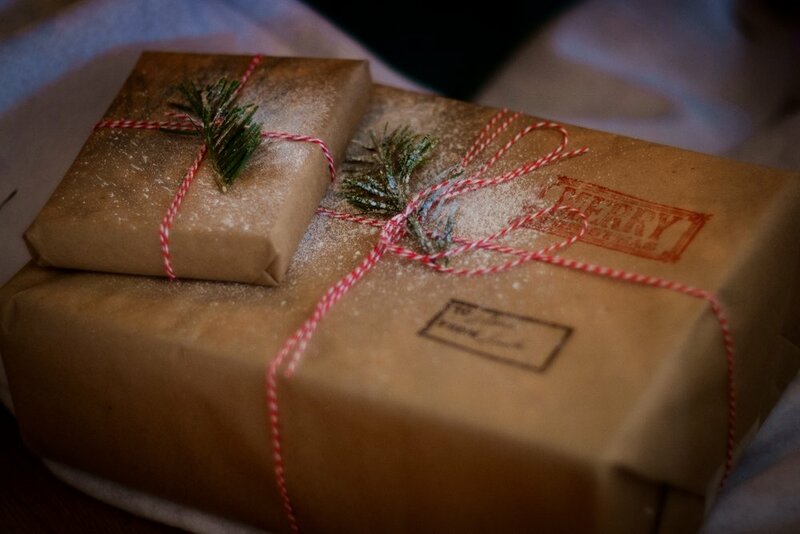 A necessary chore which can feel overwhelming when there's so much else to do, with a little mindful attention wrapping gifts can become a way to bring you back to why you are wrapping these gifts, these tokens of love and appreciation for those people you truly value having in your life. You might even feel inspired to be more creative once you get focused in this way. To get mindful as you wrap up the presents, you can focus on the sounds of the paper as you unroll it, you can listen to the paper as you slice it with your scissors, feel the texture, notice the springiness of the ribbon as it curls, and notice the colours and shapes as you fold stick and pile the presents. If your mind wanders to other chores taking you away from your task, try to repeatedly bring your focus to the task at hand, tuning into what you can see, hear, feel and perhaps touch. No tasting though for now - the chocolates you bought were meant as a gift! Food and drink are big features of the Christmas season, offering ample opportunities to be mindful. You can find out more on how to savour and notice the tastes, smells and sounds of Christmas food and drink here in this guided Christmas mindfulness exercise. Gifting yourself a Christmas candle can be a special way to mark the countdown to Christmas, filling your home with wonderful aromas. Lighting a candle can be symbolic of many things, celebration or a time for reflection, or even just a general sense of cosiness in your home. It also can mark the start or end of a mindfulness practice, when you might choose to set a small intention for yourself for your meditation or for the rest of your day. You can, if you choose not to close your eyes, use the candle as your mindfulness focus, and use it to gaze on the flickering flame, noticing the warmth coming from it, noticing the scent as it lingers in the air. Is there anything else that you notice? Go easy on yourself and others. Maybe this is a difficult time of year for you - absent friends, stress, workloads. See if you can notice what it is like to experiment with being forgiving of yourself and others, or your own mistakes. Practise being aware of any tendency for too-high standards or expectations of a perfect day. Notice and be mindful of the times when you are demanding a lot of yourself and be flexible in your approach. Compassion could be the best Christmas gift you can offer yourself and others. If you find self compassion difficult, you can begin with a guided breathing exercise such as Soothing Rhythm breathing. Just a simple act of taking time to breathe can be the beginnings of self compassion. I hope these five festive mindfulness reminders give you some inspiration to stay present over Christmas. As you practise being mindful, I'd like to encourage you to ask the following... What do you notice when you really pay attention? What do you miss when you don't? Ali Binns is a CBT therapist in Bath. She supports clients with their emotional wellbeing, using a cognitive behavioural therapy approach combined with mindfulness techniques to support the process.